Публикуем оригинал интервью на англ. языке. 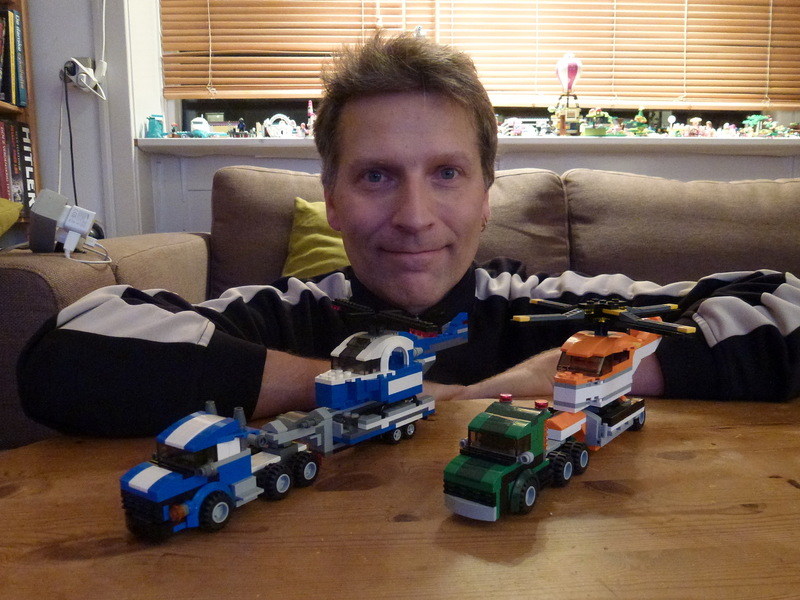 Today we are glad to present you an exclusive interview with an author of a huge number of MOCs on our web-site — Per Bonde. Legko-Shake: Hello, Per! In our blog we’ve written several reviews about your LEGO MOCs. Now it is time to acquaint our readers with the creator of these MOCs. I think it will be interesting to meet you, learn who you are and how you live. Per Bonde: Hi! I am 49 years old. Live in Denmark. Have a daughter, Vilma, age 9. Also I have 2 brothers. My big brother has other interests, but my little brother Johnny shares my interest for LEGO. He has a daughter the same age as mine. So we have had the same experience building for our daughters. We have regular build-offs with Creator sets. Legko-Shake: You’ve said Creator, not just LEGO. It is your favorite series? Per Bonde: Yes, that is where I started. And I really like this series. I can recommend looking into: 5867 «Super Speedster», 31006 «Highway Speedster», 31024 «Roaring Power», 31027 «Blue Racer», 31041 «Construction Vehicles», 31043 «Chopper transporter». Just to mention a few. They are very interesting and open wide possibilities to build different models of them. Legko-Shake: How did you get acquainted with LEGO? Do you remember your first LEGO set or may be other most favorite sets in your childhood? Per Bonde: The first LEGO set I remember is 311 «Ferry». I’ve got it for Christmas in 1973, age 6. My favourite set from my childhood was 390 «Cadillac». My brother also had one, and this was the set we spent most time with. We also wished for 391 «1926 Renault» and 392 «Formula 1». Never got any of them. As a matter of fact our childhood period with Lego was short enough. We have no memory of any Lego sets after 1976. So I was 10 and my brother was 9 when we stopped getting new Lego! Legko-Shake: You have so many MOCs which are the alternate builds of official LEGO sets. How did you come up with this idea? Per Bonde: When my daughter was old enough to get LEGO, she started to get LEGO Friends and later LEGO Elves. I initially helped her assembling it. She quickly wanted to do it herself. So instead I spoke with my brother Johnny. As I’ve said before, he has a daughter the same age, and had been through the same experience. 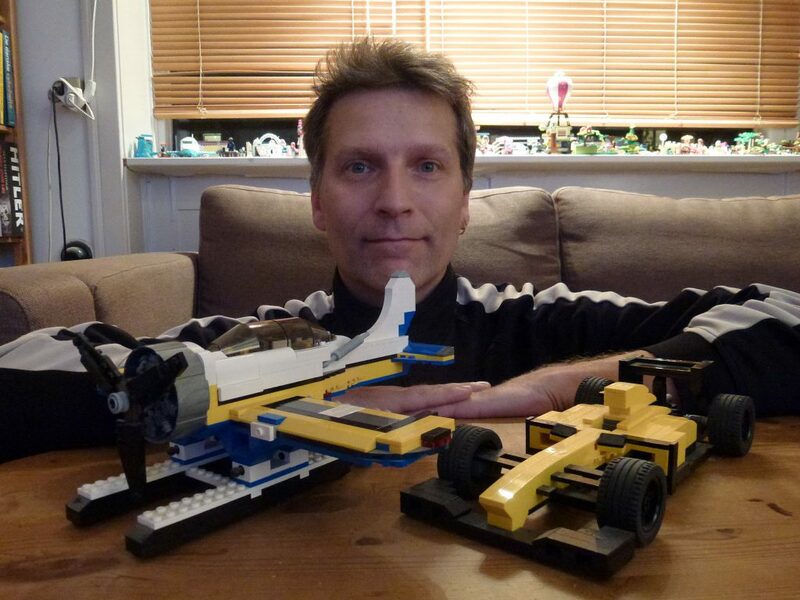 We found out that there is a big LEGO community on the internet for both children and adults. Looked into it and found out about building additional builds out of LEGO Creator sets. We started buying Creator set 31014 Power digger. We build the main build and used the spares to make an extra digger in the back. Not worth publishing. I find it really challenging to come up with playable and interesting alternates being limited by the bricks of a specific set. So we decided to make a build-off with my brother this way. Our build-off is just a friendly competition or a challenge. We both build something with the same set. When we are done we meet and compare and comment. Then we post them on the internet. I never thought I would make so many alternates. It was supposed to be a number of build-offs just between me and my brother. All my brother’s builds are from a build-off/competition/challenge. Our latest is with 31033 «Vehicle Transporter». We both have build a Big Rig Truck with Trailer. Legko-Shake: Which set was the first for build-offs with your brother? Do you remember it? Per Bonde: Yes, Creator set 31006 was where it actually started. So I have only been building since September 2014. I’ve made a F1 car with a service center from 31006. I’ve built the car without looking at any pictures. Really pleased with the result. It is very playable. Today I would have made a more realistic one. Besides I want to mention that the creation of alternative builds also is a way of extending the life of a single set, so people only need to buy one set to get countless alternates. This part of it has grown on me since I started. In short: I like to help! Legko-Shake: What model in your practice was the most challenging or interesting? Per Bonde: My most interesting MOC was my third one built from Creator 31011. It was my first MOC where I tried to make something from real life. I’ve built the Arado AR196 floatplane. I also really like my MOC with Creator set 31025. Instead of a house of some sort, I’ve made an entire Mountain Village. The most challenging was the National Museum of Denmark. A micro build with 1770 bricks. I work as a guard on the National Museum of Denmark. That is why I’ve made this MOC. I can also mention my ‘1 chassis 5 trucks’ with Creator 31043 «Chopper transporter». Legko-Shake: Per, you have so great experience of MOC building. Could you please share it with our audience? For example, are there any especially useful parts which help to make an interesting model? Per Bonde: Building mostly with Creator-sets I use what is in the box. But a good Creator set can make more than one type of vehicle. Have a look at 5765 «Transport Truck», 31033 «Vehicle Transporter», 31041 «Construction Vehicles», and 31043 «Chopper transporter». These are the most recent sets I have worked with. I really like studless parts. It makes for more beautiful builds. Just look at the 2 VW Beetle made by LEGO: 10187 from 2008, and 10252 from 2016. A huge difference. Legko-Shake: Do you have any special techniques or secrets? Per Bonde: I can tell you something about my building process: I once saw a documentary about a danish painter, Kurt Trampedach. He was asked when his pictures were done. He said they told him so. I try to do the same with my Lego. I keep on changing bricks and colors till it speaks to me. So all my builds takes quite some time to make. On the other hand I do not have any regrets with any of them. I never try to hurry a build. Legko-Shake: Per, how about your favorite LEGO set? Do you have it? Per Bonde: 8169 «Lamborghini Gallardo LP 560-4» from the Racers theme. I used it to make the current Renault F1 car RS16. I like 5765 «Transport Truck» from 2011 a lot. Have had it for a year and could not get it going. When I gave 31043 a break, I came up with 11 alternates in no time. But then again 31043 «Chopper transporter» is really a great set. I really like the colors. And 26 alternates is more than I expected. As I’ve said before from my childhood it must be 390 «Cadillac». As you can see my favourites change over time. Maybe my favourite is just the current one. Legko-Shake: Are there any principles you follow choosing a new set for your collection? Do you take into account the possibility to build MOCs from them? 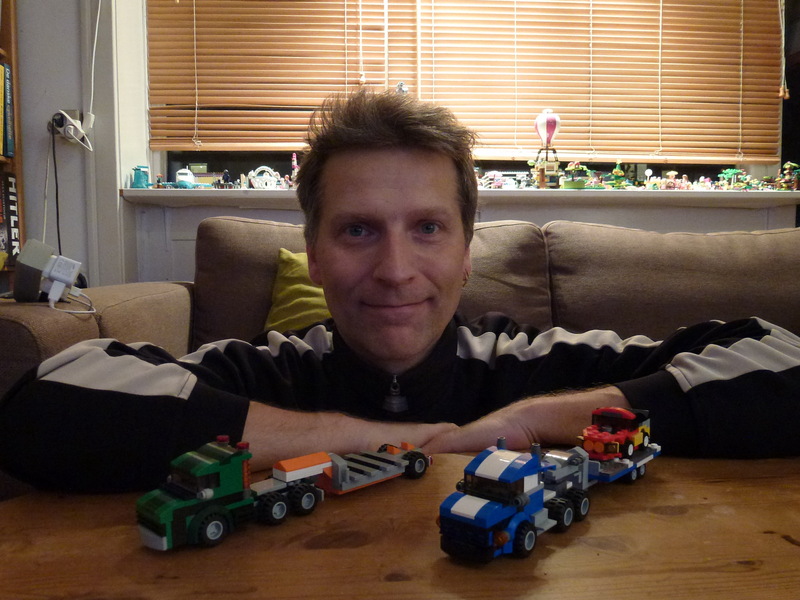 Per Bonde: I buy most of the big cars that are not Technic. Other than that I buy Creator sets. I only buy a set if I can see some potential for alternates. Mostly car or airplane oriented. I do not care much about the different big and small houses in Creator. Besides that Peter Szabo is really good at making alternates of these sets. And they are really good! Legko-Shake: With Christmas just around the corner every child (and not only child) makes wishes and asks for gifts from Santa Claus. If you would have a chance to receive a gift of 3 of any LEGO set in the history of the company — what sets would they be and why? Per Bonde: 392 Formula 1. The set I wanted most as a child. Never got it. Haven’t bought it. 5581 «Giant Truck». I really like Model Team. And in my opinion this is the best LEGO truck ever. 5590 «Whirl and Wheel Super Truck». Model Team again. Their best helicopter transporter. And the airport firetruck is also the best of its kind. So nothing fancy. But those are the sets I would choose. I haven’t got any of the above. But I keep getting back to them when surfing for sets. I would also like to have room for the entire Winter Village series. No room for that. Legko-Shake: How do you organize your parts storage? Per Bonde: I do not need to organize that much building alternates. I just keep the sets in their boxes. I share some big boxes with my daughter. They are organized in 4 boxes. Black/brown – all shades of grey – all the studdless – the rest. That’s it. Legko-Shake: How do you recommend to choose new sets for people with a small collection of LEGO? For those who do not have opportunity to have a big collection of Legos? Per Bonde: I will have to recommend Creator. If you do not want to build alternates, you still get a lot of classic LEGO. And because it is not licensed sets and rarely includes minifigures, you get a lot for your money. Legko-Shake: What other hobbies besides LEGO you are fond of? — I have always played chess. Nowadays I play on chess.com. Only 5-minute games. — I have always played darts. I meet with friends to play once a week. Legko-Shake: Per, thank you very much for the interesting conversation. We’re looking forward hearing from you in the future. Per Bonde: Thank you too. It has been really interesting to participate, and I can not thank you enough for this experience. And I hope you get a lot of positive response.